The silhouette of the pintail is made distinctive by its long neck and tail. The drake is noticeable by the striking white line extending up the back of their chocolate colored head. 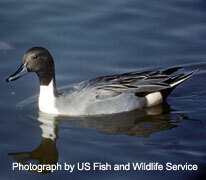 Pintails have an average length of 26 inches and an average weight of 1 3/4 pounds. 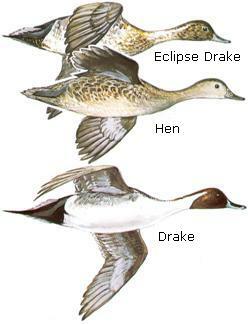 These ducks use all four flyways, but are most plentiful in the west. In South Carolina, they are a winter resident to the Coastal Plain and Piedmont regions. 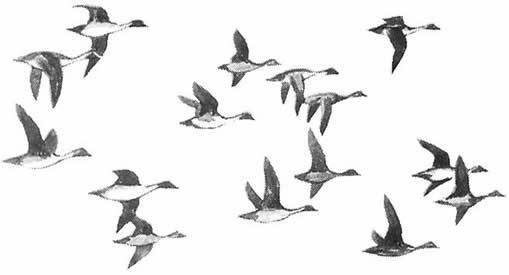 In the summer pintails are found in open areas with shallow wetlands with low vegetation. In the winter they can be found in a wide range of shallow freshwater and intertidal habitats with low amounts of emergent cover. Pintails primarily feed on grains, moist-soil and aquatic plant seeds, aquatic insects, crustaceans and snails. They are agile on land and often feed in grain fields. Pair formation begins in late fall and early winter. Upon return to the breeding grounds, hens make their nest scrape away from the water in short grass or vegetation. They tend to nest in more open sites then other upland nesting duck. After the female constructs a simple nest of grass and other vegetations she lays 3-12 pale olive greenish eggs. The drakes whistle and the hens have a coarse quack. Extremely graceful and fast fliers, fond of zigzagging from great heights before leveling off to land. Dives for food in various situations. Males show no evidence of territoriality on the breeding grounds, and only defend the immediate area around the female. Ducks form large flocks on the wintering grounds.